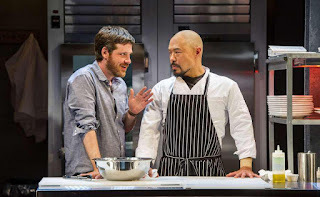 Unfortunately, this mini-review of “Seared” must be written in the past tense, as the run of this amazingly delicious play ended on August 4th. Written by the prolific Theresa Rebeck, the comedy was intended for anyone who eats – in other words, everyone. “Seared” literally and figuratively sizzled with luscious dialogue in rapid pace. The lead actors portraying co-owners of a restaurant (Hoon Lee and Michael Esper), oftentimes standing at opposite sides of a long food preparation table, seemed to play a ping-pong of words on speed. Their fights were peppered with salty language, as one would expect in the tightly choreographed work in a restaurant kitchen. WTF staff selected well, serving “Seared” as one of its main dishes for its 2018 season. A relatively new play, written in 2016, here’s hoping that “Seared” soon finds many more audiences. 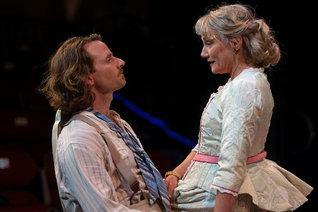 Based on a play in the late 1800’s by August Strindberg, the only problem is its title. Perhaps a direct translation of the original, it doesn’t quite work in this dark comedy about revenge, relationships, and retribution. Three of Shakespeare & Company’s top actors – Jonathan Epstein, Kristen Wold, and Ryan Winkles – take the stage at the Bernstein Theatre on the set of an 1889 artist studio. Epstein’s older gentleman portrays an erstwhile mentor to Winkles naïve sculptor. Enter Wold as a globe-trotting sophisticated woman of means, whose relationship with her young husband (sculptor) is atypically convenient for her alone. The mystery of the play lasts approximately four minutes in. However, the execution of the secret, with twists and turns, is the crux of the story. Epstein portrays a master manipulator with Winkles as putty in his hands. In a role that’s quite new to the latter (Winkles usually stars in comedies), the actor proves his versatility. As for Wold – she can do anything onstage, and always to perfection. This new play by Jen Silverman asks what one woman can do for her people, for her nation, and for the love of her life. In this funny and moving piece, Tony Award-winning playwright Terence McNallys sharp dialogue illustrates how reconciling loss and transgression can reveal the enduring nature of love. While Leonard Bernstein’s hit musical and Academy Award-winning movie of modern-day “Romeo and Juliet,” audiences never grow tired of this poignant story. Harriet Harris stars in this farcical, raucous comedy production which is directed by Matthew Penn and written by prolific playwright by Christopher Durang.